To celebrate Chinese New Year, Year 5 were invited to Kams Palace Restaurant. Pupils spent time sketching the wonderful Chinese artefacts in the restaurant and looking at the Chinese writing on the menus before taking part in a traditional Chinese lion dance. They moved energetically around the restaurant wearing a fantastic lion costume. Kam, parent to Sasha, Yasmin and Luca, explained the significance of Chinese New Year to pupils and wished us all a prosperous year ahead, as is the custom of the time. 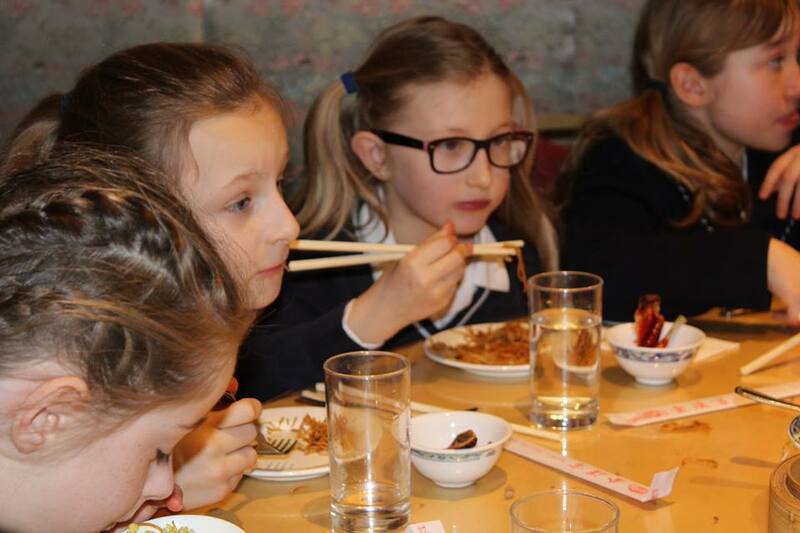 Pupils were treated to an amazing Chinese banquet. Even though some of us hadn’t tried Chinese food before, we all tasted a variety of dishes. Miss Hanslip and Mrs Skilling were surprised by the amount of food that we all ate – it was simply delicious! Thank you Kam for our memorable visit. We can’t wait to visit the restaurant again with our families and friends.